Where Have All the OC Democrats Gone? Have the Democrats surrendered huge swaths of Orange County to the Republicans? Are Orange County Democrats in such poor shape that they can’t afford to pay $1,001.13 filing fees? With eight days left in candidate filing, it appears the Democrats have abandoned the 37th Senate District, the 68th Assembly District, and the 73rd Assembly District. The Democrats also appear to be on the verge of failing to have someone make the top two to get to November in the 45th Congressional District and 48th Congressional District. There are also only 35 Democrats running for 42 directly-elected spots on their Central Committee. There are 82 Republicans running for 42 directly-elected spots on the Republican Central Committee. Let’s also not forget each party’s top vote-getter for Congress, Senate, and Assembly get ex officio spots for their respective Central Committee. Democrats have bragged of closing the registration gap with Republicans, even overtaking Republican registration in five cities: Santa Ana, Anaheim, Garden Grove, La Habra, and as reported in the Orange County Register last month: Irvine. Closing the registration gap or having a plurality in a city is all well and good, except the hilarious thing is the 143,487 Democrats in the 37th Senate District, the 67,657 Democrats in the 68th Assembly District, and the 68,202 Democrats in the 73rd Assembly District will have to vote for a Republican. Perhaps, the Democrats just can’t afford to pay the $1,001.13 filing fee for candidates for the State Legislature. In 2015, the Democratic Party of Orange County raised $66,193 in 2015 while the Republican Party of Orange County raised $248,989. The Democratic Foundation of Orange County raised $26,635 while the (Republican) Lincoln Club of Orange County raised $208,171 ($160,977 in its state PAC and $47,194 in its issues PAC). In the 45th Congressional District, Congresswoman Mimi Walters faces a challenge from Mission Viejo Councilman Greg Raths, yet there are two Democrats running who will presumably split the vote and fail to make the top two. 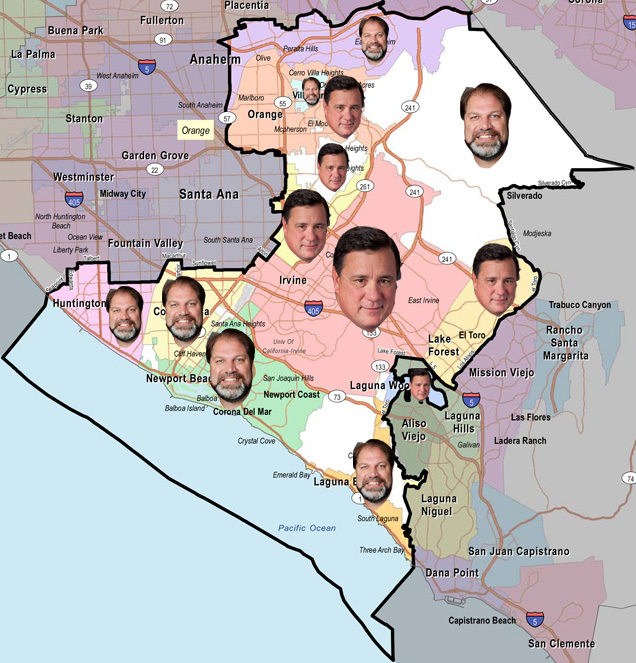 In the 48th Congressional District, Dana Rohrabacher faces a challenge from Colin Melott, yet there are two Democrats running who will presumably split the vote and fail to make the top two. In the 37th Senate District, Senator John Moorlach faces a challenge from Assemblyman Don Wagner, with no Democrats running. In the 68th Assembly District, there are five Republicans and no Democrats running. Some might argue the lack of Democrats in the legislative races and exactly two Democrats in the Congressional races is a malevolent scheme to get Republican vs. Republican races in November. Well, that’s hard to believe when there are only 35 Democrats are running for 42 directly-elected spots on their Central Committee. Orange County Democrats are simply so disorganized that they have no candidates in huge swaths of Orange County and are in grave danger of failing to make the top two in more swaths of Orange County. FULLERTON, CA – Members of the Assembly Republican Caucus and local community leaders will hold a press conference on Thursday to urge Democratic leaders to fast-track the Assembly Republican transportation plan. Four months after gaveling in a special session on transportation, the Assembly Republican plan to #FixOurRoads is still the only practical, comprehensive plan on the table that does not raise taxes. Unveiled in June, the 9-point plan would generate $6.6 billion in annual funding for roads and highways without new taxes. In addition, roughly half of the funds generated for transportation by the Assembly Republican plan goes back to local government to help fund local infrastructure improvements. To learn more about the Assembly GOP plan, click here.